Its beautiful iridescent color contrasts perfectly with the green environment of the aquarium. Moreover, it is one of the most robust species of its kind: a very good choice for beginning aquarists! This sheet will help you take care of your Rosy Barb! How to feed the Rosy barb? Omnivorous: all forms of food are accepted with plant supplements. It is best to give him its daily ration in several times. Occasionally, fasting is recommended. What kind of behavior does the Rosy barb have? The Rosy Barb is very active and playful (with its fellow creatures, they tease and chase each other) but it remains a peaceful fish. This fish likes to search the sand for food. It is gregarious and must be kept with a shoal. Who can live with the Rosy barb? You can keep it in a community aquarium but with fish that are not too shy and big enough. Indeed, its lively and restless temperament could hinder the calmer fish. Small cyprinids, rainbow fish or loaches will make good roommates. 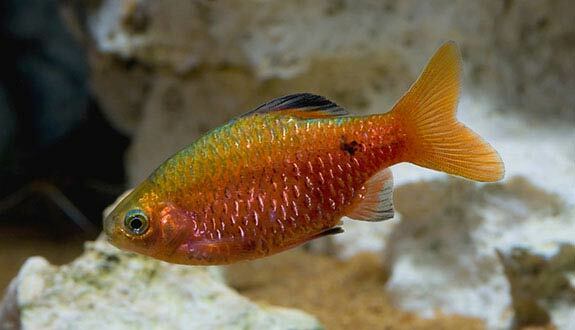 How to breed the Rosy barb? Its breeding is easily achievable. Sometimes, the Rosy Barb breeds without the intervention of the aquarist. Nevertheless, if you want a higher fry survival rate, it is better to dedicate a special tank dedicated to their breeding. Place a protective grid in your breeding tank (20 to 100 L (5 to 26 US gallons or 4 to 22 Imperial gallons) depending on the size of the group) to avoid egg predation by adults. The lighting will be very weak, the temperature will be 24°C or 75°F and the pH to 7. The spawning can be done in groups (males a little more numerous) or in couple. The parents and the protective grill are removed after spawning and 50% of the water is changed. As a precaution, you can treat eggs with methylene blue (this is not mandatory, however). The incubation lasts 24h at 24°C 75°F. Note that the fry grow better in a shallow water. Feed the fry 3 to 4 times a day. Fry food: infusoria, nauplies of Artemia and Cyclops, artificial food for fry. Which aquarium for the Rosy barb? The scenery is of little importance, even though the Rosy Barb will feel more comfortable in a well-planted aquarium and dark medium sand substrate. Watch out for possible plant damage (use strong plants and secure them securely). Add floating plants and some roots to your decor, but leave plenty of free swimming space. This fish is quite polluting, it will require a fairly powerful filtration and frequent water changes, but the current must not be too strong in its living area. It can potentially live in an unheated aquarium. Rosy Barb is one of the most robust species of its kind and it will be a very good choice for beginning aquarists. You can observe this fish rubbing on the substrate, which is a sign of well-being! There are different varieties: veiled, red, diamond, gold, and one with golden only on the dorsal. Puntius conchonius khagariansis is now a variety of Pethia Conchonius and no longer a species in its own right.